This post has been promised for a while now. 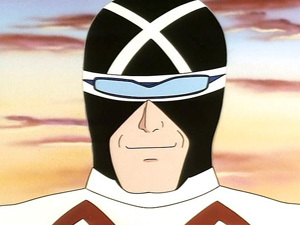 I’m finally getting to it, G.
My brother G requested that Racer X, from the cartoon Speed Racer, be his avatar for this post. I am happy to oblige, even more so when I catch myself up with this character and read he is “[an] heroic, mysterious, flamboyant, selfless, sympathetic and often brooding soldier of fortune.” Okay, maybe the soldier of fortune part is a bit much. But heroic? Yes. Mysterious? Yes. Flamboyant? Yes, I think his oft-embarrassed teenaged children would agree. Selfless, sympathetic and brooding? Yes. YOU KNEW WHAT YOU WERE DOING WHEN YOU CHOSE THIS PICTURE, G.
I’m trying to remember my earliest memory of G, but to me he was always around, ready to involve me in some manner of mischief, or just a new discovery. Once our parents were old enough to leave him “in charge” while they went out, we developed a new ritual as soon as the door closed behind them. G would say, “Let the wild frolics begin!” We’d imagine swinging from the chandelier, but in actuality the frolics usually involved making popcorn. We didn’t have Jiffy Pop around, or a popcorn popper, so by necessity this involved taking the biggest pot available in the kitchen, coating its bottom with inches of Mazola, probably having the heat up too high, and not shaking the pot enough, resulting an ungodly stench of burnt popcorn and oil throughout the house. I don’t how the pot ever came clean. Sorry, Mom. We fought a lot, but there were never fisticuffs. G is almost six years older than me and that wouldn’t have been very sporting. There were lots of insults and fake-insults and slammed doors. Speaking of doors and fisticuffs, G managed to make his way – via fist – through any number of doors in the house in which we grew up. Most were in anger or frustration, though one time I actually slammed my bedroom door on his fist. Another time, while G entertained me and my best friend M with a silly dance in the kitchen, his heavy Hebrew school shoe flew off his foot and right into a closet door. He got familiar with spackle and paint, but not particularly gifted at it. Against all odds, and against all we know about learning as we get older, a few years ago my family assembled at a Mexican restaurant that had been in favor but which we quickly realized was going downhill. At the end of the meal, Uncle G was entertaining Young J and Young A by pantomiming a game of – I can’t remember now, tennis? Football? I think it was football. He took a few running steps backwards and tried to make a thumping sound against the back wall of the restaurant. His arm went right through it. It was a moment that would have horrified and embarrassed a normal family, perhaps. Having never been a very normal family, we had to hustle ourselves – all dozen of us – outside onto the sidewalk before our peals of laughter further offended the restaurant owner, who was decidedly not happy. I watched through the window as G apologized and offered to fix the damage himself. Somehow they didn’t take him up on that. He did pay for the repairs. Thus far, I have made G/Racer X sound like a clown. You know what? He is. But he is obviously a lot more than that. He had a paper route, which I would help him with when I felt like waking up at 4 a.m. (once, maybe?). And he had a burning need to be an entrepreneur from very early on. In high school, he ran a bike repair shop out of our basement. He made up business cards, he made enormous orders of supplies and inventory which I was allowed to help him unpack, as his unpaid assistant. He did not need 24 tubes of chrome polish, but they did come in a handy display box which impressed me very much. Ditto on the dozens of rolls of handlebar tape. G logged hours teaching me to drive, a project that spread over a number of summers owing to my initial lack of interest, the availability of only stick-shift cars in our family, and maybe some general familial inertia surrounding the youngest member learning to drive. G was the one who spent hours with me working on parallel parking on humid summer days in the high school parking lot, with one of the worst cars in our fleet – no power steering. After those practice sessions, I must have had biceps to die for. I couldn’t move my arms, either. G and I also spent innumerable hours at one of two seasonal hangouts: the local pool and the ice rink. I was never a particularly gifted swimmer or skater, but G wanted to play hockey. My parents refused to let him. Result: Today he not only plays hockey, he coaches, and one of his daughters is a very talented goalie on her team. He’s also a very active fan of the local NHL team, and has done the unthinkable by getting my mom into it as well. Every Mother’s Day on Facebook, G posts a photo of Mom wearing a team jersey and looking bemused and also maybe a little befuddled, like she’s not quite sure how she got there. I love it. Recently, G moved his business offices. The process was so time consuming he had no time to pack his office. When he got to the new one, he dumped everything out on the floor and forced himself to deal with it. This was obviously going to need to happen fast, because he’s a CEO. But being as prone to distractions and sidetracks as I am, a project was born that I never could have imagined. He found some old issues of our high school literary magazine (he and I had both been staffers, at different times, with the same advisor). This was not some mimeographed and stapled affair. We won national awards and there were amazing writers represented . He decided to use the fancy new scanner at his office to create electronic versions of the issues he had. Then he put out a call on Facebook for issues from other years. (I’m sending mine with Mom next week to get scanned.) And he did it as a tribute to our advisor and teacher, P, who was extremely influential to many, many years of students. When I learned of this gesture, I was in the car, on our way back from a day trip that had begun with another thing that had nearly made my head explode (in a good way). My heart was filled again with such love for G, and this truly random (but… maybe not) act of kindness that made a lot of people very happy.